Today’s Post: NPCs Blood for the Blood God! Aggressive. As a bonus action, the bloodletter can move up to its speed toward a hostile creature that it can see. Aura of Fear. Creatures within 20 feet of the bloodletter must succeed on a DC 15 Wisdom saving throw or become frightened for 1 minute. A creature can repeat the saving throw at the end of each of its turns, ending the effect on itself on a success. If a creature’s saving throw is successful or the effect ends for it, the creature is immune to the bloodletter’s aura of fear for the next 24 hours. Blood for the Blood God. For every creature it reduces to 0 hit points, the bloodletter gains a +1 bonus to damage on melee attacks for 1 minute (up to a maximum of +5). Blood Frenzy. The bloodletter has advantage on melee attack rolls against any creature that doesn’t have all its hit points. Daemon Aura. Hostile creatures within 30 feet of the bloodletter have disadvantage on Wisdom saving throws and saving throws against fear. Magic Resistance. The bloodletter has advantage on saving throws against spells and other magical effects. Multiattack. The bloodletter attacks four times. Hellblade. Melee Weapon Attack: +10 to hit, reach 10 ft., one target. Hit: 15 (2d8+6) magical slashing damage. On a critical hit or when the bloodletter reduces a creature to 0 hit points, creatures able to see the attack make a DC 15 Wisdom saving throw or gain the frightened condition for 4 rounds. A creature can repeat the saving throw at the end of each of its turns, ending the effect on itself on a success. Speed 60 ft., fly 100 ft. Aggressive. As a bonus action, the bloodthirster can move up to its speed toward a hostile creature that it can see. Aura of Fear. Creatures within 50 feet of the bloodthirster must succeed on a DC 19 Wisdom saving throw or become frightened for 1 minute. A creature can repeat the saving throw at the end of each of its turns, ending the effect on itself on a success. If a creature’s saving throw is successful or the effect ends for it, the creature is immune to the bloodletter’s aura of fear for the next 24 hours. Blood for the Blood God. 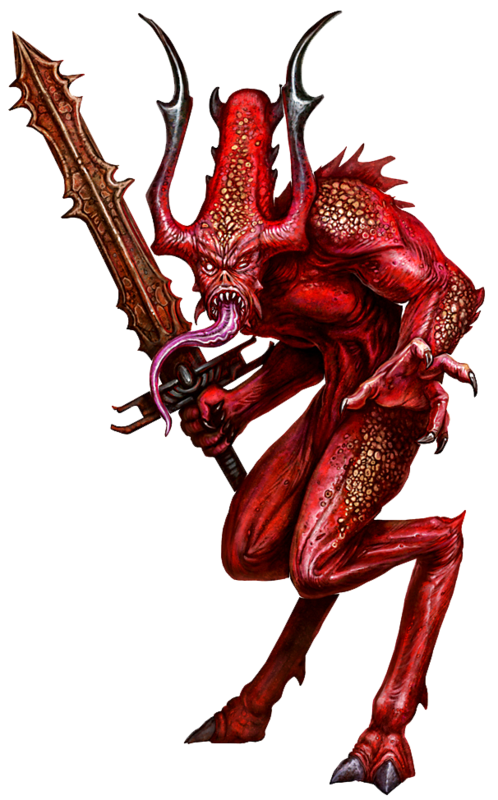 For every creature it reduces to 0 hit points, the bloodthirster gains a +1 bonus to damage on melee attacks for 1 minute (up to a maximum of +10). Blood Frenzy. The bloodthirster has advantage on melee attack rolls against any creature that doesn’t have all its hit points. Daemon Aura. Hostile creatures within 60 feet of the bloodthirster have disadvantage on Wisdom saving throws and saving throws against fear. 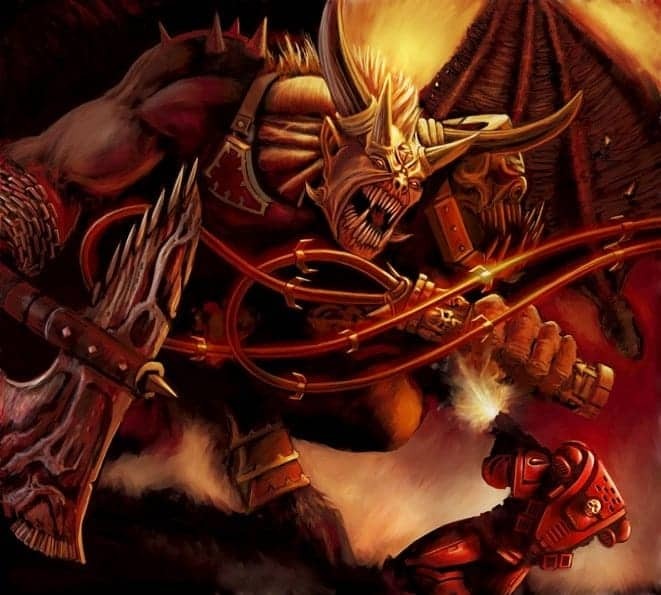 An allied creature within 60 feet of the bloodthirster regains 1 hit point at the start of its turn and advantage on its first attack roll each round. Magic Resistance. The bloodthirster has advantage on saving throws against spells and other magical effects. Regeneration. The bloodthirster regains 10 hit points at the start of its turn. If the bloodthirster takes radiant damage, this trait doesn’t function at the start of the bloodthirster’s next turn. The bloodthirster dies only if it starts its turn with 0 hit points and doesn’t regenerate. Supreme Strike (3/short rest). Once per turn when taking the attack action, the bloodthirster can declare one attack to be an automatic hit. Multiattack. The bloodthirster attacks four times. Axe of Khorne. Melee Weapon Attack: +14 to hit, reach 15 ft., one target. Hit: 26 (4d8+8) magical slashing damage. On a critical hit or when the bloodthirster reduces a creature to 0 hit points, creatures able to see the attack make a DC 19 Wisdom saving throw or gain the frightened condition for 6 rounds. A creature can repeat the saving throw at the end of each of its turns, ending the effect on itself on a success. Whip of Khorne. Melee Weapon Attack: +14 to hit, reach 30 ft., one target. Hit: 22 (4d6+8) magical slashing damage, and the target must succeed on a DC 22 Strength saving throw or be pulled up to 25 feet toward the bloodthirster. On a successful save the target is knocked prone.